By day she would look out for the still ones, the quiet ones, those who danced and sighed and dreamed alone. And at home, her head full of their stories, Adelaide would work into the night, taking a little bit of the world and making it her own. Adelaide lives alone in a shop that was once bustling and lively. She observes the world around her, and in particular the lonely people who inhabit it. She makes art from what she sees, but her quiet life is missing something. An unexpected encounter with Fox, who she has observed, but who has also been observing her, leads her to put herself outside her comfort zone, transforming not just her own world, but the lives of the other lonely people around her. 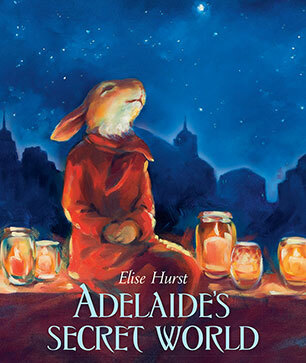 Adelaide’s Secret World is a magical, richly wrought picture book. Rabbit Adelaide lives in a world inhabited both by humans and by a wonderful array of animal characters. Readers of all ages will enjoy discovering the fantastical elements – flying fish, a boat sailing through the sky, a bear and a goose sheltering together under a tree, a lion dancing with a human, and much more. The story is gentle and minimal, so that readers can interpret and ponder during – and long after – reading. The art is simply divine, again with much to ponder. Dot loves Teddy, and Teddy loves Dot. When Mum and Dot go on an outing, Dot brings teddy along for the ride. But, in the rush to get off the train, Dot loses Teddy. The kindly stationmaster assures her that the train didn’t take teddy – rather Teddy took the train, and has gone for a big adventure. Although she isn’t sure, Dot gets involved in imagining Teddy’s adventures. Finally, at bedtime, Teddy comes home, delivered by the stationmaster. Teddy Took the Train is a delightful picture book about imagination, adventures and courage. 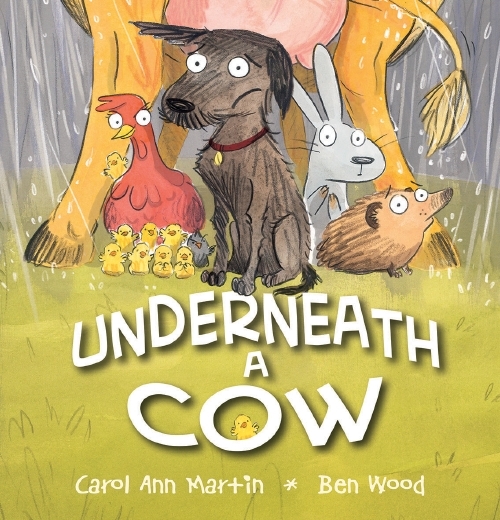 The rhyming text is fun to read and the illustrations, using a range of media including collage, ink and acrylic are warm and both sensitive and gently humorous. The depiction of Mum in a wheelchair is a wonderful touch, with the disability not forming a part of the written narrative, and thus part of the family’s life rather than the central issue of the book. The door opens and Dad and Mum sneak out. Somewhere in the darkness a clock ticks off the seconds. I silently count each one – five…fifteen…twenty five. Stephen is shy, but never so shy as when he meets his great aunt Lola for the first time. She’s really really old and she’s very grumpy too. Stephen is scared, but Mum and Dad say they have to stay with Aunt Lola because she’s lonely and they’re the only family she has. It’s only three weeks, after all. Stephen gets to meet the neighbours, learn how to fish, play cricket and climbs – simple things. He also starts to learn about his family, and especially about Aunt Lola. And when there’s an emergency Stephen realises maybe Lola isn’t so scary – maybe she’s his friend. The Simple Things is a beautiful tale of family, friendship and generations. Stephen is a quirky, loving boy and Lola is an intriguing character who readers will be keen to get to know. Their developing relationship is a pleasure to witness. Condon has a gently humorous touch as an author, and the focus on a child who is gentle-natured but brave in his own way, makes for a heart warming read.